The Westmount Recreation Centre (WRC) recently earned Leadership in Energy and Environmental Design (LEED) Gold certification with its revolutionary design. The facility, located in Westmount, Que., sets a record as the world’s first arena with underground rinks, which subsequently helps reduce energy costs. The award-winning Municipal Operations Centre in Newmarket, Ont., has achieved both form and function as an esthetically pleasing, energy-efficient facility featuring bi-fold lift-strap/auto-latch glass doors. Register soon as The Buildings Show starts at the Metro Toronto Convention Centre on November 29. The Buildings Show, one of North America’s largest expositions for the design/construction industry, is coming to the Metro Toronto Convention Centre from November 29 to December 1. 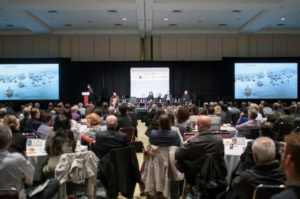 The show comprises Construct Canada, along with the Property Management (PM) Expo, HomeBuilder and Renovation Expo, the World of Concrete Pavilion, and IIDEX Canada. More than 1600 Canadian, U.S., and international exhibits will showcase the latest innovations in the building world. Produced by Informa Exhibitions, the three-day event attracts around 30,500 design, architecture, construction, and real-estate professionals. In addition to networking opportunities and product demonstrations, participants can choose from more than 350 seminars—earning continuing education credits in the process—led by industry experts. Topics range from architectural and interior design and to building codes and accessibility. Show-organizers have also lined-up summits, roundtables, and workshops where attendees get the opportunity to dig deeper into issues affecting their profession. The magazine’s November issue has a detailed preview of the show. To register, click here. For more information, visit www.thebuildingsshow.com.